Bagged goods are NOT all the same. Demonstrate your superior products with superior bags. fresh bag design brings fresh appreciation of your finest products. 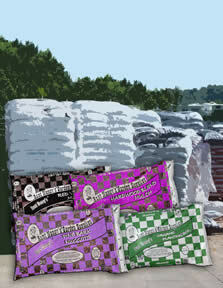 Designed for Wood-Tech, LLC the Aunt Nancy line of soils and mulches consists of many bags color coded for customer ease. You've seen them in Pikes and other fine, independent garden centers. EarthCycle, Inc. processes colored mulch under their own label as well as other private label goods. Signs and banners help sell your products.